White Bird Of Paradise and all other sizes and varieties of Bird of Paradise plants are an ideal choice for a medium to bright light interior plant. The Bird Of Paradise are also known commonly as the Crane Plant and are often used in interior landscapes due to their attractive appearance, impressive flowers and unique style. They come in all size pots ranging from a 4″ all the way up to 17″. Interiorscapers love them because they are one of the slower growing plants and tend to stay full and bushy while adding an upscale and exotic look to their environment. 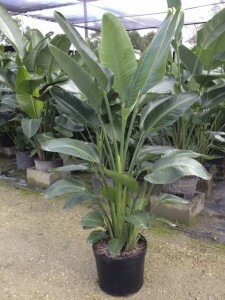 Some varieties of Bird of Paradise plants are available in heights over 10′. With leaves that look very similar to the Banana leaf, these specimen plants add a tropical look to any bright light environment. White Bird of Paradise plants prefer temperatures in the 60’s and 70’s and prefer a moist, well drained soil. For in-depth care instructions please visit our care instructions page here…. We have the best selection of wholesale plants in the NJ and NYC region. We specialize in selling wholesale plants for interior landscaping, fundraisers, school sales, wedding and special events.